Woe unto the checkbook of the average household with teenagers. Between the landlines, the cell phones, and the text messages, it's easy to rack up hundreds of dollars in monthly phone-service bills--not counting any overages you happen to incur. Talk is cheap? Says who? Fortunately, you don't need to cut the (phone) cord--you just need to cut your costs. It's easier than you might think, especially if you're willing to make a few minor changes to your chat habits. Voice-over-IP services like ViaTalk offer a wealth of calling services for a flat (and low) annual rate. Ditch your landline with a VOIP service: If you've been reluctant to switch to voice-over-IP phone service, which uses your broadband hookup for voice calls, maybe now is the time to reconsider in light of the potential savings. ViaTalk, for example, gives you two phone lines (though not two numbers) and a year of unlimited local and long-distance calls for $199, which comes to $16.58 a month. Vonage, the granddaddy of these services, charges $25 a month--still quite a bit less than the telcos. Both services pile on the features--voicemail, Caller ID, call-forwarding, and so on. And both allow you to keep your existing number. Estimated savings: $250 per year on a standard primary phone line, not including long-distance charges. The plug-and-play MagicJack offers dirt-cheap phone calls via your PC and broadband Internet connection. Add a second line for peanuts with MagicJack: Do you need a second line? Plug a MagicJack device into your PC, and then plug any phone into the MagicJack. This USB gizmo gives you a new phone number and a year's worth of voicemail, Caller ID, and unlimited calling services for $40 (after that, the service is $20 a year). The only downside: You need to leave your PC running 24/7. Estimated savings: $240 or more per year on a second landline. Switch to a prepaid cell phone: Not much of a talker? Rarely use more than a fraction of your allotted minutes? Then steer clear of phone contracts, which usually run about $40 monthly, minimum, and lock you in for two years. Instead, consider a prepaid phone and accompanying service such as AT&T GoPhone, T-Mobile Prepaid, TracFone, or Verizon InPulse. Depending on the service, you either buy minutes in advance (usually starting at $25 per block) or pay by the day: a buck for each day you actually use the phone, plus 10 cents per minute of airtime. These could be perfect solutions for kids, seniors, and anyone else needing an "emergencies only" phone. Estimated savings: Up to $500 per year, depending on airtime consumed. Don't pay outrageous international roaming rates when apps like Truphone let you phone home for pennies. Make dirt-cheap international calls with Truphone: On a recent trip to the Bahamas, I had two choices for calling home on my iPhone: Pay AT&T's insane $2-per-minute rates for international service, or pay 6 cents per minute to Truphone. 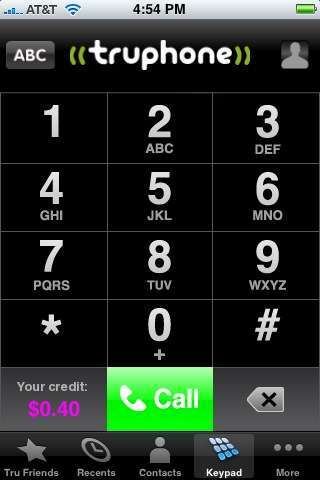 This free VoIP app is available for BlackBerry, iPhone, and Nokia handsets, and it's coming soon for other models. All you need is access to a Wi-Fi hotspot (preferably a free one, such as those at many Starbucks outlets). That's not always convenient, but when you're talking about a 97-percent discount on international calls, convenience be darned. Oh, and if you're calling another Truphone user, you don't pay a dime. Estimated savings: $19.40 on a 10-minute call to the United States. Send free text messages: Most carriers charge 20 cents per text message. Most teenagers exchange a gazillion text messages per month--on their parents' dime. That's some ugly math. You could lower the rates by adding a messaging package to your service plan, usually to the tune of $5 to $20 per month. But the idea here is to make your bill go down, not up. If you're the sender and you're near a PC, you can bypass your phone altogether and send messages gratis via Gizmo SMS. Just enter the recipient's phone number and your message, then click Send. If you want a two-way solution, try Cherple, a free program for Mac and Windows that lets you receive texts as well as send them. Gmail users can do likewise by enabling Text Messaging (SMS) in Chat, a new Google Labs feature that adds texting capabilities to Gmail. Finally, iPhone users should snap up SMS Touch, a $3 app that lets you send unlimited messages. Replies land in your e-mail inbox. Estimated savings: $5 to $50 per month.